The good news is that there is a whole new CD coming of Carmichael and Allen, so that we will be able to hear more of these compositions, music / lyrics. Soon! And the quartet heard above — with variations — will appear again at the 2016 Party. This CD is accurately titled. 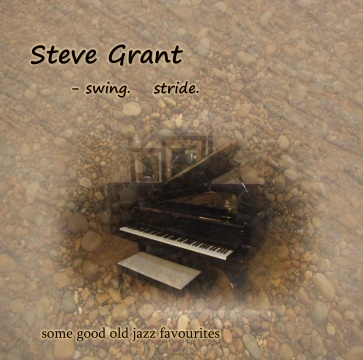 Pianist Steve Grant (from Australia) does both — neatly, wittily, and spicily. 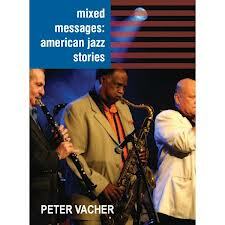 The disc’s subtitle is “some good old jazz favorites,” which is also truth in advertising. There aren’t any liner notes for the disc, so I hope Mr. Grant forgives me if I write the lines that I think should be there. Many players in these idioms good-naturedly make the error of overwhelming the listener with their technique. An Ellington original — a stride showpiece eighty years before this — was called LOTS O’FINGERS, and they take that ornateness as their goal. Volume and tempo follow, and the result can be a density that is impressive but exhausting. Not Steve Grant. He can play at rapid tempos (the opening SWEETHEARTS ON PARADE is anything but languid, and HOW DEEP IS THE OCEAN suggests high tides!) but his playing is lucid, clear. I thought of the 1935-7 Wilson solos (with a more experimental harmonic range), anchored by a light stride bass opened up with walking tenths and rhythmic suspensions. Grant is not a gifted imitator, stringing together phrases laboriously learned from the recordings: he is an improviser, going where his impulses lead him. On each track, he shows himself to be a master of implying: he doesn’t stress or lean on the listener, “Look! I can really Get Hot, can’t I?” Rather, a Grant solo is a series of small playful excursions, “Was that a tango I just heard going by? Quick, look out the window!” But he leaves himself and the listener a good deal of space, and the overall effect is, “That’s so simple. If I practiced a bit more, I could play like that,” what I call the Bing Crosby Effect. Another illusion, as anyone who sits down at the piano finds out. Most of the tracks toddle along at a rocking medium tempo, but each one has its own delightful explosions. LAURA, for instance, is full of quite remarkable right-hand arpeggios that show a harmonic imagination that’s anything but simple. THE MIDNIGHT SUN combines optimism and melancholy with understated emotional power. And Grant makes it possible to hear BODY AND SOUL without decades of familiar accretions on its hull. But Grant — because he seems to be so simple — continually tricks us. The first chorus of THESE FOOLISH THINGS might lull us into complacency,”Oh, he’s just playing the melody,” and then we wouldn’t notice the sweet, quietly subversive things he does in the choruses that follow. Only a musician with a deep sense of humor and an expansive conception of what it means to improvise would or could create such rewarding music. This CD is well worth investigating, and I’ve kept on being surprised by it on repeated playings. The disc offers SWEETHEARTS ON PARADE / OLD FASHIONED LOVE / LAURA / BABY WONTCHA PLEASE COME HOME (I reproduce this title exactly) / THE MIDNIGHT SUN WILL NEVER SET / THESE FOOLISH THINGS / HOW DEEP IS THE OCEAN / BODY AND SOUL / DID I REMEMBER / PASSPORT TO PARADISE / BYE BYE BLACKBIRD. It was recorded in the Echidna Studios, Yarra Glen. The Beloved and I went to Olga Bloom’s “Bargemusic” last Thursday to hear the ebullient stride pianist Judy Carmichael and her trio — with sterling fellows Jon-Erik Kellso and Chris Flory — and the barge wasn’t the only thing a-rockin’. I’ll be writing up that concert for Jazz Improv (www.jazzimprov.com), but take that opening sentence as a preview. Judy’s new CD, SOUTHERN SWING, just out, pairs her with two like-minded Australian stars, cornetist Stephen Grant and guitarist John Scurry, at the 2007 Wangaratta Festival of Jazz. It presents her set at the festival as it occurred, and the results are cheering. Judy offers a bouncy, streamlined version of many of Fats Waller’s most famous pianistic motifs. Her rhythm is energetic, her pleasure in what she is doing comes through wholly. Catch her bell-like solo passages late in “I Ain’t Got Nobody,” quite moving in their patient simplicity, her willingness to let the piano ring out. Some of Judy’s pleasure, however, comes through in her chatty banter between numbers: the band is so rewarding that I would have traded much of the banter for one or two more songs. The trio creates some very pleasing moments of improvised synergy — the riffs that close the Wilson-Holiday inspired “If Dreams Come True,” the pretty Grant-Scurry duet on “Crazy He Calls Me,” and the mournful yet swinging “I Ain’t Got Nobody,” suggesting a Basie small group after hours, taking its time. Visit www.judycarmichael.com to purchase this and other CDs, to see Judy with an alligator on her lap, as well as a ckip of her sextet (featuring Kellso and Michael Hashim) on Brazillian television. For CDs recorded at Bob Barnard’s Jazz Parties from 1999 on, don’t miss www.rockyotway.com.